The Reclaimed Teak Outdoor Sofa from the new Manhattan deep seating collection is an interesting and contemporary piece. The design is a stunning mix of influences, which might spark a debate as to the origin of the look. Some of the aspects incorporate Japanese design, others a contemporary New York City urban vibe. Many of the overall features of this Deep Seat Outdoor Sofa denote an origin in the 1950’s modernistic styles. This sofa comes with Dove colored cushions as shown. W75" x D34" x H31"
Regardless of where it falls on the design palette, you can expect an interesting and very cool feel to this piece. 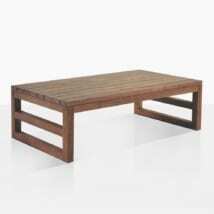 The wood is given a walnut stain to accentuate the uneven grain pattern of the reclaimed pieces. The Return of cool is completed with the well-matched contrasting colors of the (included) Sunbrella® cushions. The square shape is rigid looking but the comfort of the sofa makes it incredibly inviting. 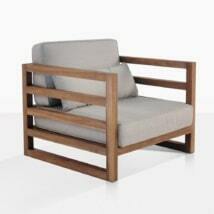 The long linear design of the wood pieces gives an excellent base for the 5 inch cushions and the lumbar pillows. 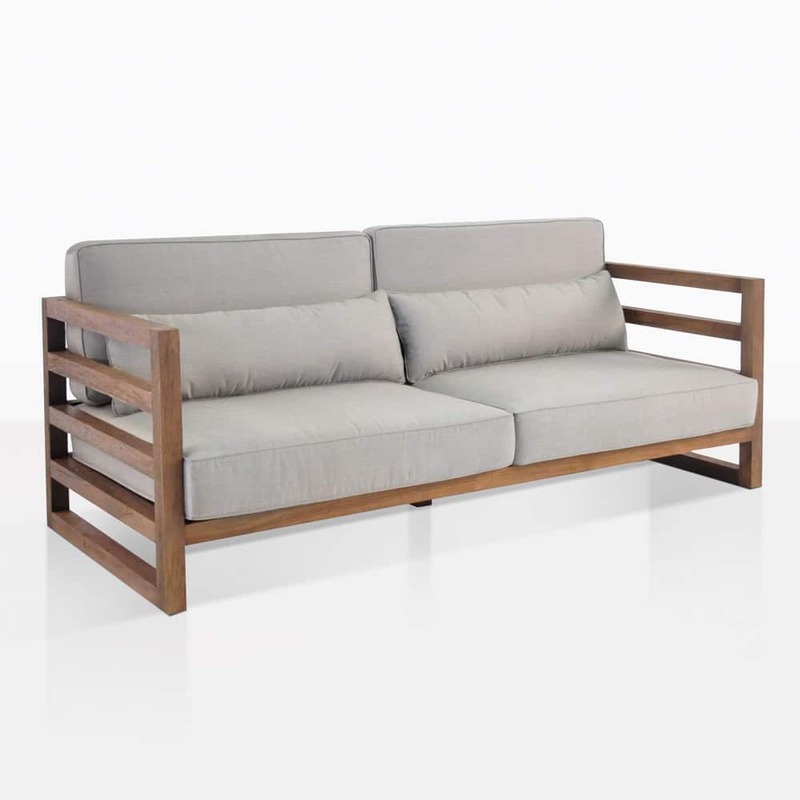 There is a certain peacefulness to the reclaimed wood that speaks to the long history of the wood and allows this reclaimed teak outdoor sofa to have an air of confidence. Square architecture might at first seem too rigid, but this piece has a lithe feel to it as you notice the slim and dark features. The 14 inch seat height from the floor gives it a low, cool confidence; the 5 inch cushions provide comfort without being bulky or overwrought. It could find a nice home on the patio of a New York apartment, but would be equally at home in a zen garden on the west coast. Minimal features and an athletic look make it a match for a lot of different interiors and exteriors, including more traditional gardens. The dark finish of the reclaimed teak on this outdoor sofa makes it a natural choice for areas with vines or other strong green tones. The clean, sharp, sophisticated looks of this piece add to the obvious benefits of owning a functional outdoor sofa.